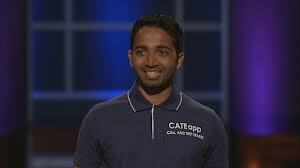 CateApp - Neal Desai gets right down to business and wants $50k for a 5% stake in the privacy App. valuing the technology at $1 million. The CateApp erases calls and text messages which Robert Herjevic calls a cheaters App. Desai says He's not the developer but bought the rights to it for $17.5k cash. Neal and his Sister have invested around $45k into the business at this point that has around 10,000 customers so far. The cheating app. retails on Android and the I-Phone for $4.99 and the Blackberry is $9.99 on their respective websites. These are O.K. numbers but a $1 million valuation on this app business? Keven O'Leary calls Neal the cheater. The Sharks call into question the morality of selling such a product. Desai, quick on his feet, uses an analogy of carrots. LOL, of all things carrots? If you didn't necessarily like them but they were selling at a 100% markup, you would still plant the carrots because "That's where the moneys at". So True. Keven O'Leary is the first to get down to business. He starts with telling Desai his valuation for the business is crazy. He then makes an offer for CateApp for the full $50k and wants 50% of the company. He also discloses his idea of using this product for his Mutual Fund Business not disclosing valuable Sales Report information. Smart Man that O'Leary, but maybe not so smart to divulge another obvious use for this technology so fast. Daymond gets in on O'Learys deal. Barbara says She will give Desai the $50k but for only a 30% stake as long as they re-brand the image to more of a personal application. Daymond makes a case that two Sharks are better then one. Neal counters with 15% for the 50k. O'Leary makes a rare decision and lowers the percentage down to 35%. Barbara Corcoran really wants this deal and lowers her percentage to 25%. This turned into one of the Best Negotiations In Shark Tank History. Neal really wants to work with both Daymond and O'Leary and was confident enough at the same time to talk them out of another $20k which they quickly agreed too before Barbara could counter their offer again He handled the negotiation's brilliantly and was rewarded by the Sharks for his bold negotiations. DEAL - Daymond John and Keven O'Leary for $70k and 35% equity in the privacy app. Neal and his sister actually purchased the CateApp on the popular site Flippa which is known for buying and selling websites. It was listed and sold 2 months prior to the new listing when the first buyer could not produce the funds to complete the deal. Fortunately for Desai, he did have the funds mostly from trading Pokemon cards online. I sure would hate to be the first person that passed on this deal knowing how far it has come in just a years time. Then again, it would take someone like Neal and his shear determination to get the privacy app. on the Shark Tank and start a bidding war amongst the Sharks. So, any update on sales? Is it successful? Interesting how MC now has a company that erases messages after viewed...hmm similiar. Keeping you app on your phone itself indicate that you are cheating. Whats the point? How will you hide the app? So, guilty regardless of any actual cheating.. Sign me up for that!! not The best app in The world ! ....and beside how much money did They make any update on That one ? A lot of problems on the Playstore. No feedback. And their website doesn't work,that's never a good sign. Is this app still alive? Was trying to download it for my Iphone, couldn't find it anywhere. Already down again? As a software developer that was my initial thought. 1. As soon as published people start reporting problems on their specific cellphones. 2. Bugs will occurs as soon as it is in more than "happy path" development use. 3. He is neither the developer nor can he code, thus who is gonna fix the issues? 4. No fixes result in bad app ratings and that is the end. This guy simply has been cheated by the one creating a cheating app, what an irony. Wha? Because if it worked that well, he would have made the money on his own. Sharks, always remember: Mobile/Web Software is *never* finished. You always need developers for the software lifecycle to adjust to phone and browser changes and fix occuring bugs.